Rajasthan is a vibrant state dotted with numerous architectural wonders and many religious sites. While on a tour to Rajasthan, you must pay a visit to Pushkar which is one of the most important towns of immense religious significance. The meaning of the word Pushkar is a pond formed by a flower and it is located to the northwest of Ajmer. This town is also one of the five sacred dhams (pilgrimage places for the Hindu devotees). It is quite interesting to note that this town has also become popular among the foreign tourists and they could be spotted in large numbers during the gala Puskpar Fair. Your tour to Pushkar is certainly going to be an enchanting one since this is not merely a religious spot visited by the pious devotees but is a conglomeration of the rich culture and tradition of the rural Rajasthan. Among the most well-known tourist attractions of Rajasthan is the globally renowned Pushkar Fair, which is also the largest cattle fair in the world. Swarms of tourists arrive from all over the world to see this extravagant event that has been going on for generations in this quaint town. The Pushkar fair is among the most notable fairs and festivals of Rajasthan and attracts immense attention of the tourists and the media. The Pushkar fair is a highly exciting event and the entire town pulsates with vibrant energy during the fair which is held during the auspicious occasion of Kartik Purnima in the month of October or November. Thousands of people gather here from far off places in colorful attires to be part of this gala occasion, and bathe in the sacred Pushkar Lake. You will find men in their customary attire, flaunting long and impeccably maintained moustaches, their turbans brilliantly colored and huge in size. The women sport bright saris, long traditional skirts and all kinds of jewelry. 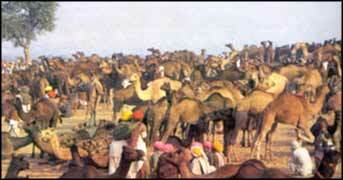 A number of exciting events characterize the Pushkar fair and the most famous among them is the camel racing. These amazing creatures of the desert are beautifully decorated and are the center of attraction during the fair. In the evening, enchanting folk melodies fill the entire ambiance with ecstasy as the bards sing timeless love ballads and stories of great courage, valor, and sacrifice, all integral to the Rajasthani traditions. There are many other things to see in Pushkar including the Brahma Temple. It is the only temple in the whole world dedicated to Lord Brahma (creator of the world). Adding to the exquisiteness of this town is the famous Pushkar Lake which is a sanctified spot featuring 52 bathing ghats (platforms). The other tourist attractions in Pushkar include the Savitri Temple and Warah Temple. Find more information about Pushkar by browsing through the site touristplacesinindia.com, which offers valuable travel information on Pushkar and the other tourist places in India.